The TRANS Committee was established in 1979 to co-ordinate efforts between the major transportation planning agencies of the National Capital Region. The Committee is a neutral forum for the exchange of information on technical guidelines and best practices. In addition, it manages transportation studies and collects data for transportation planning. The six members of the committee span all three levels of government. 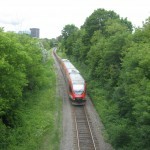 They include the National Capital Commission, the Ministère des Transports du Québec, the Ministry of Transportation of Ontario, Ville de Gatineau, the City of Ottawa, and the Société de transport de l’Outaouais. Funding responsibilities are shared by the six member agencies. The proportion of contributions may vary for some projects. The TRANS regional transportation model, housed in an EMME/3-ENIF software shell, is used to reflect existing trip patterns and travel choices, and to simulate the effects of future scenarios featuring varying growth, alternative transportation facilities, services and policies. Traffic counts, conducted at screenlines across the region, are integrated into a common data set. These counts cover urban and rural roads alike, as well as highways and bicycle paths. TRANS has conducted a truck survey, an external travel survey, and three origin-destination (OD) surveys among several others. Most recently, the 2011 OD survey was conducted in fall 2011.